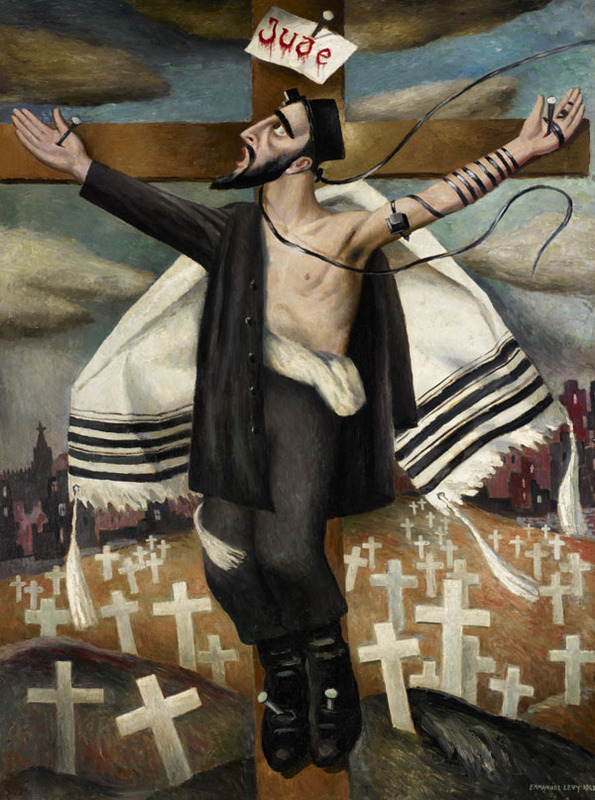 Levy's Crucifixion is a personal protest against Jewish persecution in mainland Europe during the Nazi era and probably his most powerful work in this genre. Here, Levy has used Christ as a symbol for the suffering of the Jews. From the nineteenth century onwards, Christ had been variously depicted as a preacher, scholar, mystical visitor or a victim of anti-Semitism by Jewish artists, including Maurycy Gottlieb, Wilhelm Wachtel and Marc Chagall. Levy draws on both Jewish and Christian imagery to present Christ as an orthodox Jew with his Tallit (prayer shawl) and prayer phylacteries. The label ‘Jude’ in blood red above and the rows of white crosses (traditionally marking Christian graves) symbolise the many Jews who were being killed at the time. Religious iconography was a dominant theme in Levy’s work, and his Two Rabbis with Scrolls of the Law (Ben Uri Collection) employs a similar pared-down modern style and bold patterning to illustrate the joyous Jewish festival of Simchat Torah. Levy’s central theme, however, was always the human condition. He held six solo exhibitions in Manchester between 1925 and 1963, with further solo shows in London, including at Ben Uri (1953, 1978 and 1989), where his work was also shown from 1935 onwards in numerous group shows.